Bloomsbury Rooms is a beautifully illustrated book which explores the relationship between Bloomsbury notions of aesthetics and the actual interior designs of the homes in which its members lived. Christopher Reed takes their various houses as starting points – 46 Gordon Square, Asheham, Brunswick Square, Charleston, 52 Tavistock Square – for meditations on their socio-psychological development and the notions of art practised by Vanessa Bell, Walter Sickert, Roger Fry, and Duncan Grant. It should be said from the outset that although this has the size and has the high production values of a coffee table book, it is not a casual or an easy read. Christopher Reed situates Bloomsbury within theoretical concepts of art that were competing with each other in the early phase of European modernism in a serious and heavyweight fashion. And these theories themselves are analysed in a political and ideological manner. In fact his study is not only about Bloomsbury’s domestic interiors. He is profoundly well-read in the whole Bloomsbury oeuvre, and right from the start he emphasises the political radicalism out of which much of its artistic practices sprung. He engages quite passionately with art theory, social criticism, and the philosophic relationship between politics and human relations to which they gave expression in their domestic lives. He sees this as an early version of an idea we now express as ‘the personal is political’. His study challenges the accepted notion that these artists drifted away from orthodox modernism. He argues that their aesthetics were formed by fully conscious choices, made by people who were often more politically radical than was generally acknowledged – both then and now. Whatever you think of the book’s theoretical arguments, it’s a beautifully illustrated production, full of fascinating paintings, fabrics, decoration, interior design, and original graphics. It’s meticulously researched, fully annotated with extensive notes, an enormous bibliography, and a full index. 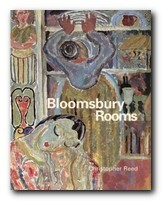 And Bloomsbury was a world of graphic and interior design, as well as literary culture. Vanessa Bell was a painter and book illustrator, Duncan Grant was a painter and interior designer, and Roger Fry was a painter, art critic, and at one time advisor to the Metropolitan Museum of Art in New York. Many of their designs for the Omega workshops are in evidence here, as well as the decoration of their own homes in both London and the countryside. Artistic theory aside, for most readers it will be the photographs, illustrations, the paintings, ceramics, and textile designs which will be the main attraction here. There simply aren’t any other books in print offering such a rich glimpse into the visual world that Bloomsbury represents.